As your business grows it is very likely that you will need to add additional warehouses, or perhaps expand an existing one. It may well be that you are opening up in new locations in order to increase your operations, or simply that while you can run your business from one office, it becomes more cost-effective to have additional warehouses to better serve customers in different localities. There is a lot of thought and logistical effort that needs to go into managing one warehouse, let alone several, and the management of one is very different from that of two, three, or a dozen. There are a number of things to think about when planning a warehouse, not the least of which is to make proper use of every last inch of floor space. 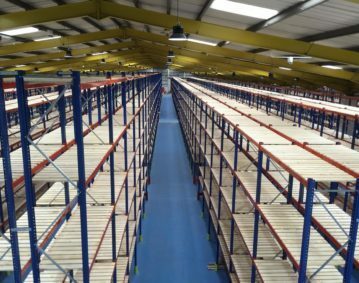 If you think of your warehouse as an empty box you can see that it is possible to fill the box right to the top by using pallet racking and fork lifts and thus make the most efficient use of space. There are also a number of ways to efficiently organise your stock. One way is to place quick selling items that have a high volume close to the receiving area while items that have a lower volume can be placed further away. If you have items that customers often order together you can site them next to each other. Barcode scanners are another efficient way of tracking your inventory and you can use them in several ways in the warehouse which will save you time, and therefore money. You can actually download some inventory trackers on to your mobile or tablet as an app now, which turns it into a barcode scanner so you don’t need to buy one. Of course, as your business expands and you need to open another warehouse, things become more complicated. Certainly, you can save money on transport costs by opening a warehouse in a location where you have more customers, but you will soon find that your requirements and sales figures can be very different from your first warehouse. Customers at the new location may prefer one product over another so you may find that products that you have in stock in warehouse 1 have sold out in warehouse 2. The more warehouses you have, the more difficult it becomes, so you need to track your inventory extremely carefully in order to ensure that you do not suffer from lack of stock in one location or too much in another. Some businesses rely entirely on manual inventory control, but that can lead to real problems because it is being done by people. People make mistakes and may enter data incorrectly, forget to enter it at all, miscount things, and worse. One way to overcome these problems is by using inventory control software which will reduce the risk of human error, save money on labour, and correctly record sales and shipping. Everyone in the office will have access to the inventory information, and the software can be set to re-order items automatically so that you don’t run out of stock in any of your warehouses. At the same time it can ensure that you don’t carry too much stock of an item that does not sell so fast. Inventory control software is not necessarily cheap but it can pay for itself in quite a short period of time. In most businesses the inventory is the biggest single investment and anything that you can do to streamline procedures and make sure that you do not overstock items, while at the same time ensuring you have enough in the right places at the right time to keep your customers happy, can only be of benefit to your bottom line. Some businesses are only just coming round to the idea of implementing a WMS system, while the real forward thinkers are already looking towards the next stage of their technological evolution. Cloud based Warehouse Management Systems (WMS) are seen by many as the logical progression, removing many of the associated costs and operation headaches that come with the installation of a WMS. Whether it’s investing in new hardware, paying out for new software updates or dealing with down-time and maintenance, investing in a traditional WMS takes time and money to set-up and get running. Cloud based services are changing the way we live and work and it is already improving the infrastructure of a growing number of warehouse facilities. Below are six key reasons why you should be looking towards the cloud in 2018. Many smaller, traditional organisations are keen to evolve and invest in a WMS but are deterred by the investment required upfront. Even though the long term returns will make it worthwhile eventually, budgets are either too tight for the initial payment, or they believe the funds can be best put to use in other areas of the business. A cloud based system removes the cost of installing new equipment and the set-up costs, instead charging a small monthly fee based on how many users will be accessing the platform. It is a far more cost effective method which opens up the software to an even wider audience. Being able to access your supply chain data from any location means there is no delay in making key decisions that can impact on performance levels. Controlling the WMS from a workstation, mobile phone, tablet or laptop ensures management can remain actively in the loop even when they are not on the premises. Another cost-related pain is having to invest more into software upgrades, patches and technical staff if you reach the point of expansion. The cloud allows businesses to quickly scale up (or even down) based on your immediate needs within the business. This sort of flexibility ensures you can react quickly to changing demands without affecting performance levels. The vast majority of business experience forecasted financial highs and lows across any given year, especially those linked into physical retail outlets. Price packages in traditional WMS systems are usually more rigid in comparison to cloud based solutions, which makes it harder to adjust to the different needs through these periods. In the cloud, user licenses can quickly be added when demand is higher, and removed when business returns to normal levels. Unless you are an extremely large business, the security measures around your WMS platform usually remain the same until upgraded annually, or sometimes even longer, leaving valuable data vulnerable as new methods are found by hackers to by-pass existing systems. A cloud-based WMS is constantly updated using the latest updates and patches, ensuring your core business information is constantly protected against any potential threats. And should anything happen within your facility that damages hardware, such as fire, natural disasters or even power outages, all of the data remains securely in the cloud ready to be accessed again when you are back up and running. Most IT departments find themselves stretched as management tend to underinvest in staff numbers, which can affect the integrity of the work being carried out. Installing a cloud system lessens the burden on staff and ensures they can focus on other areas of the business to be more productive. With less attention needed on supporting an internally hosted WMS system, it will improve the quality of their work in other departments and improve overall efficiency across the entire organisation. With warehouse shuttle systems the handling of goods is carried out by using a remote controlled pallet shuttle. Often called ‘shuttle rockets’, these shuttles contain diagnosis software for troubleshooting issues and run on rechargeable batteries. There are a number of different types of shuttle systems available, from single or double deep storage, to roaming shuttles and dedicated shuttles. Racking can be set up against a wall of the warehouse which allows for more space. This system allows for loading to be done from one side with a forklift truck and the unloading on the opposite side with another. Forklifts never enter into the aisles like they do in drive-in racking therefore reducing damage. 2h Storage Solutions offer a free site survey and would be happy to advice you on warehouse shuttle systems for your warehouse operation. With years of experience 2hssl can offer industry-wide insights in the pros and cons of the various shuttle systems available. Customers can enjoy the certainty of a successful project with 2h Storage Solutions. There are many kinds of businesses that require conveyor systems, and these are used as a way to move goods from one place to another. The most common place that these are used is in factories and warehouses, where things need to be moved as a part of the automation process. There is no doubt that the right conveyor system can make things much easier, and because of this you should take the time to consider which of the systems would be best for the company that you are running. With this in mind, we have put together a list of the different systems that are available, which will help you to consider your options. This is the type of system that is most commonly found across many industries, and this is because of the fact that you can transport almost anything with this kind of system. This works by having a belt which is extended across two drums, and then carries items along it. There will usually be a half turn at some point to protect the life of the belt as a whole, so that some of it doesn’t wear more quickly than other parts. This type of conveyor can be great no matter what kind of size or weight of item you are looking to transport. This isn’t something that you would usually see in a warehouse environment, however it is still an important conveyor system to discuss. This kind of system uses a pulley system, and can be seen in use in places like dry cleaning companies, to get the clothes through the cleaning process. One thing that is so positive about this kind of system is the fact that the items being moved can be fixed in one specific place, meaning that there is no need to be concerned about them moving. You may have seen this kind of conveyor system in airports, at the point at which baggage is collected. In addition to this, some shops are now choosing this kind of system in place of a belt conveyor, if it suits the types of items that they transport. This system is best for any company who needs to transport larger items, as the rollers can deal with these perfectly. In some kinds of longer systems, you will need to take your items across a number of different conveyors in order to get it to where it eventually needs to be. The vibrating aspect of the system allows anything that shouldn’t be on the conveyor to be shaken off, and this means that the items will be much cleaner when they get to their destination. This means that the items will be in a better condition, and this will improve the process as a whole. When it comes to conveyor systems, there is no doubt that there are a few different options to choose from, and the one that you go for will depend on the kind of industry you’re in, and also on the type of items that you are going to want to transport, as this can make a big difference to what the right choice would be. When you are running a business, every single decision that you make will have an impact on the eventual success of the business as a whole. This means that the decision needs to be thought about carefully if you are just in the process of having a new system set up, so the information above should help you to come to a decision that you will be happy with. 2H Storage Solutions supplies automated conveyor systems and distribution solutions for warehouses. We manage the entire process of your automation project, from design through to implementation. So if you want the experts to help you decide what type of automation system is suitable for your business objectives, give us a call today. There is no doubt that there are a number of benefits to using warehouse automation, and this is a key reason that so many warehouses are now opting for this as a way to improve the way that they run. With this being true, you should think about whether it would be a good option for your own warehouse. We have put together a list of reasons that warehouse automation could be a great choice for you. No matter how alike you are to another business in your industry, it is almost certain that you have different needs to them when it comes to your warehouse. With this in mind, warehouse automation can be a great choice for you, as it means that you can design your processes in a way that suits you perfectly, no matter what your needs might be. One of the best things about having an automated warehouse is that it means that you don’t have to hire people to do many of the jobs that you may have needed them for in the past. Not only does this mean that you can reduce the wages that you need to pay, but it also means that you are not relying on your staff to turn in for work as much, so there is less likely to be any kind of disruption to the way you are able to run. It is no secret that warehouse space can be expensive, and for this reason you might not have as much space available to you as you might have liked. With this in mind, you should always make the most of the space that you do have, and warehouse automation can certainly help you with this. You will be able to store many more pallets in your warehouse in this way than you would have otherwise been able to, so it is definitely worth thinking about. Having an accurate inventory can be quite difficult when you are in a warehouse environment, and this is thanks to the fact that mistakes can be made if using human employees. With warehouse automation however, there is a much better chance that everything will be done correctly, meaning that you can rely on the numbers that you come out with much more. This is something that you should always be thinking about when you are in charge of a team of staff, and by thinking about using warehouse automation you will be able to make the environment as a whole safer. You could prevent your team from having to go into unsafe areas, including high or low temperatures, and it would also lower the amount of physical work that would be expected of them. This means that there would be a much lower chance of any of your team suffering from injuries while on the job. In the long term, this is something that would also save you money, as it means there is a lesser chance of your team having to take time away from work, and also less chance that you would be sued, too. There is no doubt that there are many benefits to warehouse automation. So, if you are in charge of running a warehouse, and haven’t yet worked out exactly whether you are going to use automation or not, the information above should help you to make the decision that is going to be the right thing for you. Recently we discussed the use of Autonomous Mobile Robots and how in the long-term they would prove to be the future technology used across a number of warehouses and distribution centres. At the same time we are aware that the uncertainty of Brexit means many businesses are hesitant to invest in more expensive technology. It may also be the case that for some companies, regardless of the current economic climate, a solid business case cannot be made for introducing the technology into their supply chain. Automated Guided Vehicles (AGV) have been around in one form or another for almost 70 years and there is a case to be made for and against their continued use. Read on below to find out more about some of the systems benefits and drawbacks. Increasing productivity and efficiency is the golden ticket that every business wants to win. AGVs tick these boxes due to their reliability and long term cost effectiveness. They do not tire or need to take breaks during the day. They provide higher task accuracy and can be set to work on repetitive tasks that could lead to injury, or put humans at risk over a period of time. The use of an AGV can start with as few as one but as demands grow, so too can the fleet. Their operation expands (or decreases) as and when you need it to, and the time taken to implement these changes will enhance the speed of your operational flow. If needed, AGVs can also be adapted to include robotic attachments as a cost effective gateway into more advanced technology. Their easy control handling means AGVs remain a reliable and safe way to transport goods through distribution and warehouse centres. They are designed and installed to work away from the workforce which lessens any safety concerns that may arise. What makes them particularly useful is their ability to be used in environments where extreme temperatures are standard, while also taking on heavier loads and reducing the risk of injury to staff. As is the case for any company looking to invest in new technology, the initial financial outlay can prove to be a difficult obstacle to overcome. Long term returns have to be balanced against a feasible purchasing period and offset against the reduction of labour costs. During that time it would be safe to assume that there may be some additional maintenance costs. No machine is perfect and any costing should also factor in potential downtime and disruption caused to operations as a result. An AGVs predictability can also prove to be its own worst enemy. Getting the most out of the system is very much dependent on ensuring you can maximise its focused strengths. AGVs thrive when undertaking repetitive tasks but if this not an area you need to improve, you may not benefit too greatly from investment. If the path or route needs to be altered quickly due to a new layout, or unforeseen issues, then it can take some time to halt operations and reprogram the AGV to adapt to a new workflow. At its best a distribution centre will work like a well-oiled machine, but the fast-changing demands of a warehouse means there can be a need to react quickly. If the repetitive task cycle of an AGV is suited to your operations without the need for regular fast changes, then they will be an ideal system to purchase. With the case for moving to automation being spoken for almost everywhere you look, you might begin to feel as if your organisation is being left behind. If what you hear was to be believed, the robotic revolution has already changed the face of the world as we know it. Fortunately, there is still some time to go before we reach that stage. There is a strong case to be made for many warehouse facilities to seriously start thinking about the use of automation, but it also has to be remembered that the introduction of the technology will not benefit everyone. How much automation will cost is typically the first issue addressed by companies assessing the technology. The initial outlay involved in purchasing an automated system can prove to be an obstacle too large for smaller sized companies, when balanced against short term returns. Few companies will buy the system outright and instead choose to spread the bulk of the payments across a 3-5 year period. The savings will usually be seen in labour costs and increased productivity and efficiency in the area of operations in which the system has been implemented. If the financial costs do not create a potentially negative impact then this is one of the major issues out of the way. The main reason many companies are looking towards automation is to increase capacity to meet the growing pace of demand. What needs to be looked at here is the analysis of your current capacity capabilities across every element of the workflow, including storage, employee functions and workspaces. Will the implementation of automation in one area resolve a current issue, only to create a new one elsewhere? In most cases new technology is implemented in one or two areas, rather than overhauling the entire operation. Automation is designed to resolve issues in an efficient manner and improve the full flow of distribution. If its impact is only incremental, when weighed up against the cost, the business needs may not be as urgent as you first believed. Along with the need to meet growing demand, improving service speed and overall customer experience is key to their retention and your market growth. Not only do customers expect a vast array of products at competitive prices but also fulfilment consistency and accuracy. The addition of automation will hopefully make meaningful improvements to your warehouse supply chain but this should also be felt by the customer. If throughput increases and enhances efficiency and productivity while producing significant costs savings, then customers should also benefit as a result. If not, you may have to rethink how practical automation is at this present time. The technology improves operations and saves money in the long run, but it presents the perfect opportunity to increase competitiveness. In today’s aggressive market, improving customer experience is key to achieving that. Many of the injuries and errors that occur within both the production and warehouse environment is due to human error. Employees are asked to undertake repetitive tasks for long periods of time which invariably creates issues. Automated equipment doesn’t tire or experience injury, all the while improving overall accuracy of the task at hand. This is an improvement that every warehouse can benefit from, no matter the size. This is worth giving serious consideration to especially if the business case for introducing automation is only a marginal one. What can you do if you have looked at your business needs and found that the risks outweigh any obvious gains? It shouldn’t be forgotten that semi-automation can offer meaningful solutions and a cost effective gateway into using automated technology. This can be implemented in many labour intensive tasks, reducing the physical stress and strain on the workforce while enhancing efficiency. It can also be adapted to fit your current set-up, so it is in place and working in a shorter time period than full automation may require. Perhaps, most importantly, return on investment should occur in a shorter space of time primarily due to its lower costs in comparison to fully automated equipment. Enjoy the Certainty of a Successful Project with 2H Storage Solutions. With our extensive range of high quality products, professional standards and competitive prices, 2h Storage Solutions can fulfil all your storage and warehouse requirements. Call us on 01937 585057 or fill out the form on our contact page here.. Automation is the buzz word of the moment and the subjects associated with it look set to increase in scope as the technology becomes part and parcel of warehouse life. Much has been said already about the efficiency that can be gained from it use, and the long term cost savings achieved by businesses that choose to invest. Improving distribution productivity is not the only way in which significant cost savings can be made. Managing your energy use within the facility is key to making the most out of the tools at your disposal. It is not necessarily a subject that gets people fired up, but given how much finance is spent on heating, lighting and powering operations, its importance is too often overlooked. The Carbon Trust conducted a survey last year and found that half of the 1,000 SMEs questioned were concerned about the cost of their energy bills. The organisation believe that savings up to 20-30% can be found through the implementation of energy efficient measures and the simple changing of routines. Below are some of the ways in which you can begin to lower the costs within your distribution centre. Keeping the warehouse fully lit enhances safety and provides a better working environment for those who work within it. Naturally, this will mean a lot of lights, which in turn requires a lot of energy expenditure. LED lights are the best alternative to help reduce energy bills and they can also last up to 50% longer than traditional bulbs. As a recyclable material they allow you to play your part in contributing to a sustainable environment. They also emit far less heat, which helps to reduce temperature levels during the summer and in-turn lowers the use of air conditioning, cutting costs even further. There are two ways in which doors impact on energy efficiency; their age and condition and by being left open throughout the day. When left open, heat is lost and heaters and/or cooling systems have to work harder to balance out the change in temperature. Older warehouse doors can sometimes be unreliable and slower to close, which is why the easier option is to leave them open. Ensuring there are no gaps or cracks is equally important, as is checking they are fully insulated to help maintain optimal temperature in the space. As we discussed in our article about mezzanine flooring, there are a lot of advantages to be gained from their installation into industrial spaces. One we didn’t mention at the time is energy savings. Working vertically instead of expanding operations across the ground maximises space and often means relocation is not a requirement. This obviously saves costs on the move and purchasing/rental costs, but also saves on the higher energy bills a new facility would naturally incur. If going green is a key business objective, new premises might also mean updating logistical roots and an increase in your carbon footprint. In modern warehouses, HVAC systems are typically responsible for powering the heating, cooling and ventilation. The most important question to ask is, how much time and effort goes into its maintenance? There are two answers to this questions; either you are spending too much on repairs and problem solving, or you keep the filters clean and schedule regular check-ups. Those who relate to the first response can easily feel the benefit of implementing a simple schedule for check-ups. Also think about areas not in use that do not need to be cooled or heated on a regular basis, as this should produce noticeable cost savings. The management of waste has both a direct and indirect effect on your green initiatives. Ensuring unwanted and damaged materials are cleared from the facility keeps employees safe and maximises space. To improve your carbon footprint, ensure batches of materials are separated from each other and disposed of using recyclable options. The easiest thing to do is to dump everything in the nearest landfill, which ultimately goes against every over energy efficient change you may implement inside your premises. The robots are taking over. Or so we keeping on hearing. There is no denying that the implementation of autonomous robotics is going to have huge effect on many industries but the key will be how the introduction of the systems are managed. It’s a brave new world we are venturing into with the next level of technology taking businesses towards unexplored territory. As exciting as that can be, it also raises valid concerns and a considerable amount of uncertainty about how they can be integrated into existing processes. Before being bought by Amazon, Kiva Systems were the market leaders in producing Autonomous Mobile Robots (AMRs) that were sold onto other companies. Naturally this stopped after Amazon decided to deploy and use them within their own distribution centres, rather than selling them onto potential competitors. There are now a number of alternatives available on the market, such as Swisslog CarryPick, Scallog System and GreyOrange Butler, who offer more flexible and scalable options. The previous versions of these transport units, Automated Guided Vehicles (AGVs), are slightly more cumbersome and require dedicated tracks to be installed which meant some restrictions were placed on where humans could work within the warehouse. There was also a considerable amount of preparation required, which is not the case with AMRs. Those issues no longer exist, as the AMRs will follow mapped their routes to avoid any obstacles or issues. This involves a human employee mapping this out for a couple of days beforehand, which should not cause too many difficulties, even for larger sized spaces. As with the introduction of any new system, the trick is finding how to bring them together in a way that allows them to operate efficiently to optimise the operation of the warehouse as a whole. The warehouse management system (WMS) will continue to run as the central software, of course, instructing the warehouse control system (WCS) on what needs to be picked and where it needs to go. Similar to how you would with a human, AMRs can be controlled through a task queue, which makes it no different to a typical user. Jobs will be routed to either human or robotic users, with work decided on by priority and location. With the software running through a secure cloud, this also means there is no need to bring in new hardware or software into the warehouse. Setting up an AMR also doesn’t require you to bring in an army of IT experts to get them into operation either. Even if the Wi-Fi coverage in the warehouse isn’t great, as an alternative, mobile modems can be used instead. AMRs will need to be charged which will mean the installation of docks, but these are typically very low key and offer no safety concerns to the other workers or the facility itself. Because they are autonomous robots, they take care of this themselves, without much need for ongoing maintenance or attention from other workers. For the vast majority of warehouses, this set-up time can be as short as one week, which is a surprisingly short amount of time, given how complex and intelligent the AMRs are. So while the upfront cost will be larger, the impact on operations during this period will reduce any knock-on effect and as output increases the ROI will soon be noticeable. There are also AMRs that work hand-in-hand with humans, essentially doing the legwork of transporting the goods from one location to another. With the exponential increase in online shopping, the demand placed on e-fulfilment warehouses is growing year on year, which makes the switch to autonomous mobile robots an inevitably for almost everyone at some point in the near future. The cost will come down and concerns will be eased, while the benefits will become far more apparent as time goes by. As we discussed recently*, Horizontal Carousel storage systems are one of the best ways to improve the efficiency of your warehouse operation. What we have yet to discuss are the two main alternatives, which are Vertical Carousel and Vertical Lift Modules (VLM). Although there are some similarities, it is important you are aware of the differences between the three, so you can identify which one suits your requirements more closely. It has to be said, that choosing one particular system does not restrict you from working with a combination within your warehouse. Each one has their particular pros and cons that work with well with specific types of product. That also applies to manual systems, so once you begin work with an automated system, it does not have to mean you have to transition completely. Read through our overview of Vertical Carousels and VLM’s below to see which one feels like the most natural fit for your business. What is clearly noticeable about the system is how it allows for greater storage within the same footprint, which is an advantage for any storage unit. A VLM also offers great adaptability, which is particularly useful for companies that work with a wide range of products across the course of the year. Depending on the model you choose, shelf heights can extend up to 28 inches, and if placed onto the shelf through electronic eyes, the VLM will automatically adjust to the appropriate height of the item. The shelves can, of course, be adjusted manually but the automatic alteration will help to save the worker valuable time. The flexibility of the system also allows the height of the module to be adjusted to suit the dimensions of the warehouse. Price wise they can be slightly more expensive than a Vertical Carousel, so this is a worthwhile consideration to weigh up alongside the others. The most obvious thing about this system compared to the Horizontal version is of course the directional movement of the trays. The main benefit of this carousel is that it maximises unused vertical floor space, which is ideal for compact warehouses. A Vertical Carousel also allows you to bring together more than one unit at a time, which helps to increase throughput and picking speed. Although there is less storage compared to a Horizontal unit, the smaller footprint means you can introduce more the machines into the workspace. An added bonus is that the temperature and humidity within the unit can also be controlled quite easily. A Vertical carousel is slower than a horizontal unit and the construction of the unit does also mean items have to be distributed evenly to prevent loads becoming unbalanced. Due to the limited bin space, this system may not be ideal if the product in question has a high turnover rate and needs regular replenishment. It must be remembered that while this systems can produce some amazing results and a true uplift in operational performance, like any other machinery, they will rely on your input and maintenance to ensure they continue to run smoothly. Both the VLM and Vertical Carousel’s need to be serviced periodically to ensure they meet the certification levels required by legislation, as they come under the same category as forklifts and cranes. If you are looking at these options for the first time, it’s not always easy to decide on the module that fits in with your requirements. Hopefully our information will help eliminate any initial confusion and provide you with some direction. We have vast experience of designing and installing carousels, VLM’s and many other storage systems, helping companies to expand and grow their business.